Kevin Mack was a colourful figure in Ovens and Murray football when I began to tentatively make my way in the game. Strong, tough and hard-working, he had a reputation as an outstanding ruck-rover – a Jack Ziebell -type, who provided inspiration to those around him. When Wangaratta needed a lift, he was often the bloke to boot that team-lifting goal or lay the tackle that spurred them on. As a somewhat impressionable lad, and being eager to fraternise with the opposition, I looked forward to meeting him. But the night I did, I was gobsmacked. He was half-way through ‘devouring’ an ale – a beverage of which he had become particularly fond over the years. Not content with draining the contents, he then proceeded to nibble away at the glass. Thankfully, having demolished a good portion of the pot, and with a small trickle of blood appearing at the corner of his mouth, he deposited the remainder on the counter. He was just 19 when he arrived at Wangaratta from Mid-Murray League club, Tyntynder, half-way through the 1956 season – having already made 94 appearances with his home club. The timing of his transfer was perfect. The Magpies plonked him straight into their line-up and, as they began to gather momentum the following year, he became a star. Wang booted 7.7 to defeat Benalla by 14 points on a ‘lake’ in the 1957 second semi- final at Myrtleford. They were warm favourites for the Grand Final, but were outclassed for three quarters, by Albury’s solid defence and systematic play. Wangaratta Magpies team photo, Kevin Mack is middle row, centre. They trailed by 27 points at the final change, but whittled the margin down. With a minute to spare, Lance Oswald, who had been held goalless, swooped on the ball and snapped accurately to see the Pies home by 2 points. Mack was the proverbial ‘bush champion’ and would no doubt have made it at the highest level. He received persistent offers from League clubs, but unlike his team-mates Oswald and ‘Doggy’ Rowland, elected to stay put in Wangaratta. 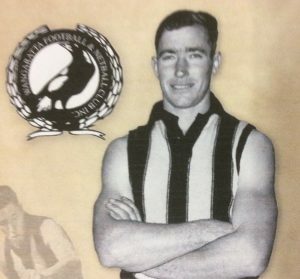 He had been strongly pursued by Collingwood, St.Kilda and South Melbourne, and trained with the Swans, but expressed no real fascination for the ‘bright lights’ of Melbourne..
His first appearance in the Black and Gold O & M guernsey came against the South-West League, as part of a star-studded line-up which included an array of ex-VFL players. He was the ‘Pies Best & Fairest in 1959, a feat he replicated in 1964. But individual awards were not his cup of tea . Mack was a true team-man, and a model of consistency. Wangaratta lost just 5 games in the 1961 home-and-away rounds, to finish eight points behind minor premiers, Wodonga. But they ‘ran hot’ in September, defeating Corowa by 40 points in the First Semi, before fronting up to Wodonga the following week. They had kicked only two goals, to trail by 11 points at half-time, but with Mack and the high-leaping ‘Rinso’ Johnstone dominating proceedings, they booted 12 goals to 2 in the last half, to whip the Bulldogs by 52 points. The Pies were all over Benalla from the opening siren of the Grand Final, and completely routed the Demons. They coasted in the last quarter, to run out winners by 63 points, with brilliant Ron McDonald completing a 16-goal finals series at centre half forward. It was a case of having everyone firing at the right time. But the general consensus was that McDonald, Mack and John Mulrooney had been the stand-outs in an emphatic finals campaign. Just as the modern-day comedy duo Hamish and Andy are always spoken of in the same breath, so were the irrepressible Magpies combination of the 50’s and 60’s – ‘Rinso’ and ‘K’ Mack. Tales of their escapades became part of local folklore. Obviously some were heavily embellished, but there’s no doubt the pair were as thick as thieves, even when Mack’s mate headed off to coach Greta. Mack was still an integral part of a strong Wangaratta side. His three goals in the last quarter of the 1964 Grand Final dragged his team back into the contest against the Rovers, but they fell 23 points short. The following year also ended in disappointment, as the Hawks triumphed by 3 points. Murray Weideman’s Albury were the pace-setters in 1966, with the Pies hot on their heels. The teams featured in a crackerjack second semi-final, with Wang reining in a handy Tiger lead and squandering three opportunities to hit the front in the last two minutes of the game. The final siren sounded, seconds before Ron Critchley got his foot to the ball with a shot close to goal. Wang had kicked 11.20 to Albury’s 13.9. But the hearts of Wangaratta fans missed a beat when they tuned into 3NE radio on Monday morning. Kevin Mack, who played superbly in the semi and had taken out the Chronicle Trophy after a fine season, had spent the night in hospital, seriously injured. The ‘old firm’ of ‘Rinso’ and ‘K Mack’ had been ‘winding down’ in the Warby Ranges the previous afternoon, and Kevin had incurred a broken neck in a diving accident. A fortnight later, the Pies, minus their vice-captain, were belted by 55 points by the Tigers in the Grand Final. It was strongly suggested to Kevin that he should hang up his boots, but he soldiered on. Part of the way through 1967, he returned to the Wangaratta side, taking his eventual tally of O & M games to 210. The Pies were reluctant to risk the on-going health of the veteran, so he accepted the job as playing-coach of Corryong in 1968, at the age of 31. Conceivably, he was now in the twilight of his career. But alas, he continued on until he was 43, thus writing another chapter in his remarkable football story. He coached the Demons to successive flags in 1968 and ’69, and played in another in 1972, among his 200 games with Corryong. Mack was 41 when he was selected as a ruck-rover for the Upper Murray inter-league side, against the Hume League. His son Ray, who was 17, and a real up-and-comer, was named at centre half forward. A recruiting officer from South Melbourne attended the game to cast an eye over the talent, and had the task of presenting a guernsey to the best player in the two Leagues under their zoning jurisdiction. He usually swayed towards nominating a promising youngster (maybe a potential Swan) but couldn’t overlook the outstanding display turned on by Mack. The fierce rivalry between Corryong and down-town rivals Federal was akin to that of Wangaratta and the Rovers, and Kevin was antipathetic towards both of the opposition clubs. The yarn is told of him wandering past the Federal ‘watering-hole’ a day or so after they had knocked off Corryong to win the premiership. He drifted in to their celebrations, set fire to the streamers which were attached to their proudly-displayed Upper Murray League flag, then walked out. The Kevin Mack career totalled more than 500 games and he became an almost-mythical figure in local footy circles. His three sons, Kevin, Ray and Michael were prominent sportsmen in their own right. Ray spent time with the Swans and was a champion utility player for Lavington before continuing on at Holbrook and Thurgoona. He is now the principal of Ray Mack Real Estate in Albury. Michael, who was a top-line basketballer, embarked on a career in banking, and was appointed the CEO of the WAW Credit Union in 2016. Kevin (Jnr) was a prominent figure in district football. Of more recent times has placed his occupation as a policeman on standby to undertake his second term as Mayor of Albury. Kevin Mack’s fascinating football career is perpetuated by his inclusion in the Ovens and Murray’s Hall of Fame – and as a member of Wangaratta’s Team of the Century.